In the week following the grand jury decision not to indict then-police officer Darren Wilson in the shooting death of Ferguson resident Michael Brown, I talked to my students and tried to listen. I was impressed with their knowledge of the case. They had been following the news, not just Facebook rantings or snippets on CNN. 1) A black person and a white person do not receive equal treatment in the U.S. When I (a white woman) and my brother (a black man) walk down the street, we do not receive equal treatment. Many factors contribute to perception, of course. Much of the unequal treatment, I believe, isn’t so overt. However, I can’t deny that experience. 2) Looting isn’t right. It looks bad. On further thought, I should have added: When looters are black it reflects badly on the black community. The media jumps on it. The response is different from when, say, white sports fans riot. 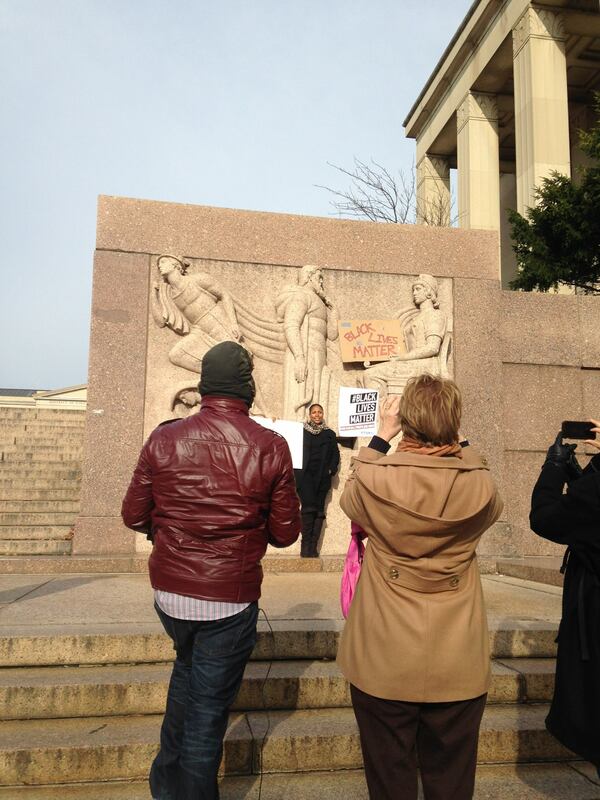 On December 9, Gallaudet faculty members organized a demonstration on the main quad. One of these colleagues talked about scrapping her original plans for the last meeting of a class on death and dying to discuss these issues. This was the last meeting of the semester, when I would have been nervous to deviate from my checklist of items about the final paper and evaluations. 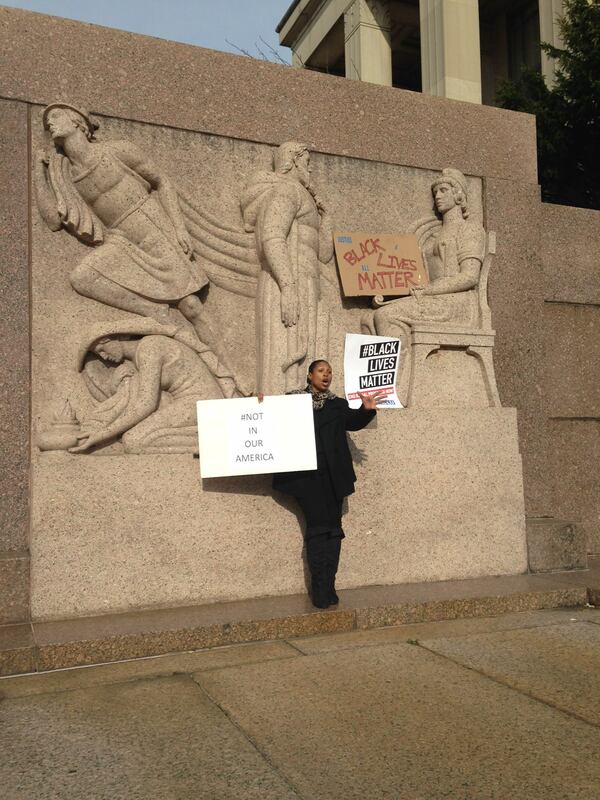 On December 13, the National Action Network brought thousands to Washington, DC for the Justice for All march. I joined in. So did colleagues in the English Department at Gallaudet, and friends from the D.C. Jewish community. Stepping back from the original snapshot reveals how other march-goers also wanted to capture this image. I’ll be teaching Fundamentals of Journalism next semester. Journalism is about shedding light. Or, as controversial reporter Glenn Greenwald says, “shining a light on what the most powerful people in the country are doing to them in the dark.” I hope I can guide them well. Be safe, be thoughtful, and–if you’re celebrating this week–have a happy Hanukkah.